Connecting organisational dots, cutting through complexity and removing corporate hierarchies are just a few of internal changes CMOs are tackling in order to bring the next generation of marketing into their enterprises. 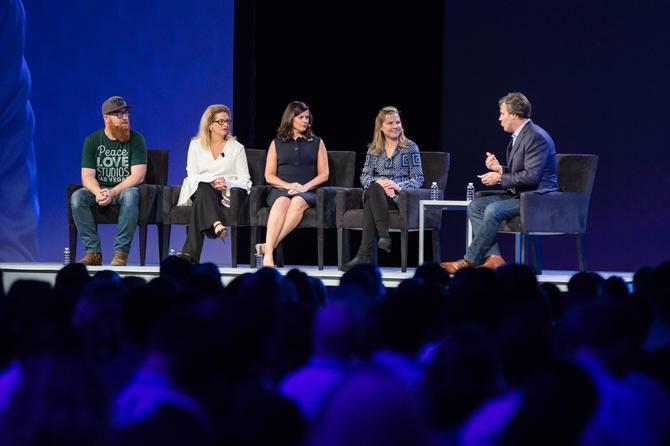 Brand custodians from Visa, Time Warner, Taco Bell and Zappos took to the stage at this year’s Marketo Marketing Nation summit to discuss what is on their priority list, as well as the approach to data, technology and corporate culture that’s helping them better engage customers. One of the biggest priorities for VISA senior VP global marketing platform and capabilities, Kim Kadlec, is connecting the dots between marketers, communicators, IT, product developers, engineers and data analysts. The aim is to break down communication gap silos between marketing and distribution to better inform product and experience design through data. What keeps Time Warner’s CMO of global media, Kirsten O’Hara, awake at night is how to use data to gain competitive advantage. To make that happen, it’s important to mobilise the whole organisation to realise the opportunity, she said. “We have gone through many cycles of transformation – every decade there are new things, whether it’s CRM, ecommerce, and now data. What makes data a significant opportunity is it cuts across the entire organisation and we need systemic change in order to realise the potential,” she said. As brand stewards, Taco Bell CMO, Marisa Thalberg, said marketers have a responsibility to cut through the complexity that exists for consumers in the marketplace, but equally, within the organisation. More widely, she saw her role as turning all staff into storytellers. Technology has an important role to play in facilitating experimentation, being forthright on what works and what doesn’t, and driving change, Thalberg said. “Culture is then what enables us to make the right decisions,” she added. The focus in recent years has also been internal for Zappos, as it strives to get the internal systems that enable the brand story to keep unfolding and changing, its ‘fungineer’, Tyler Williams, said. Williams said the Zappos brand started with a lot of ‘firsts’, and value propositions that were ahead of their time. “The industry has caught up and that’s common now. So how do we continue to get people to continue to choose Zappo has been top of mind,” he continued. “What we’ve focused on is creating new value props that are ahead of the industry. We’ve always viewed ourselves as customer service company, not an ecommerce company. So we’re looking at getting into other industries to solve for that. We want to diversify and be more resilient as a company. That commitment to customer engagement and servicing customer needs has seen Zappos launch portable toilets for the live events market. First introduced in VIP areas, the company is now looking to extend these to wider audiences. “It has amazing features, fun and makes going to the bathroom quite the experience,” Williams said. Panellists also debated the role of data in their organisation and strategic make-up. At VISA, a plethora of insights provides the ability to identify the customer stories that matter. Utilisation such data insight has led to products like Visa Checkout for seamless payment on the phone or laptop, to buyable videos with Wiliams Sonoma, Kadlec explained. Data is also rapidly informing every aspect of Time Warner’s marketing approach, O’Hara said, who added the change has happened very quickly. As an example of data activation, O’Hara pointed to DC Entertainment, which has an aggressive launch strategy. Three years ago, the team decided that it if it could market an entire franchise differently through the use of data and technology, it would succeed in making data a transformational engine for the business. This came into effect with Batman versus Superman last year. “It was the first release where we had a strategy to collect data from the first trailer drop, not just for that movie, but across all DC franchises, Every single campaign from then til March of last year needed to be a data collection opportunity,” O’Hara explained. So what would these marketers purge if they could? Williams said rigid processes that have been built by businesses to protect them are the thing he’d most like to see eliminated. O’Hara would love to make organisational change easier. “All businesses are being transformed from one extent to the other,” she commented. “Part of it is breaking things down to smaller bits so it’s not as scary for people. There’s a lack of expertise – when required you don’t have skills internally and need to bring on experts from outside, which can be unsettling for rest of the organisation. Kadlec also wanted to “take the handcuff of legacy fetishes”. She pointed out 50 per cent of millennials are using adblocking tech, and that data and talent should be used to create awesome experiences people want to lean into. Nadia Cameron travelled to Marketo Marketing Nation as a guest of Marketo.